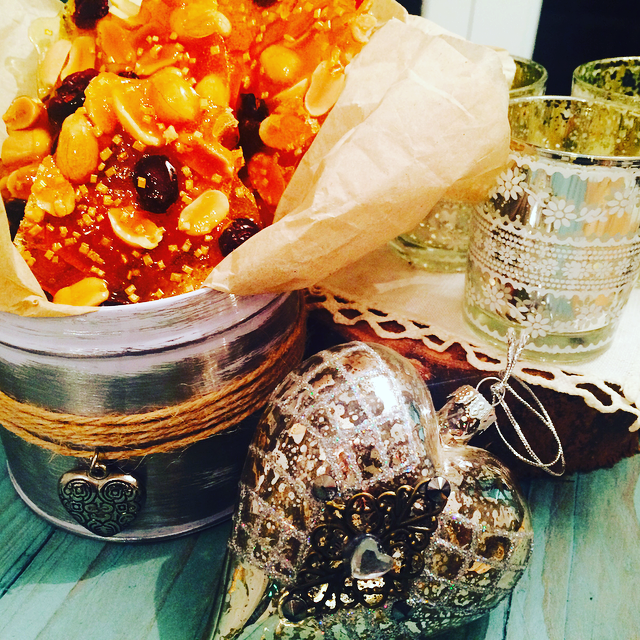 I LOVE peanut brittle, I have made it so many times in the past and once had to make a whole batch of it as wedding favours for my sister! A few years ago I had a Christmas tea party where I made cakes, jams etc for Christmas gifts, this is where I first made this brittle. You can add any nut or fruit to this, and I had contemplated macadamia, but I stuck with the peanuts as they do taste great in the brittle….make sure they are salted!! 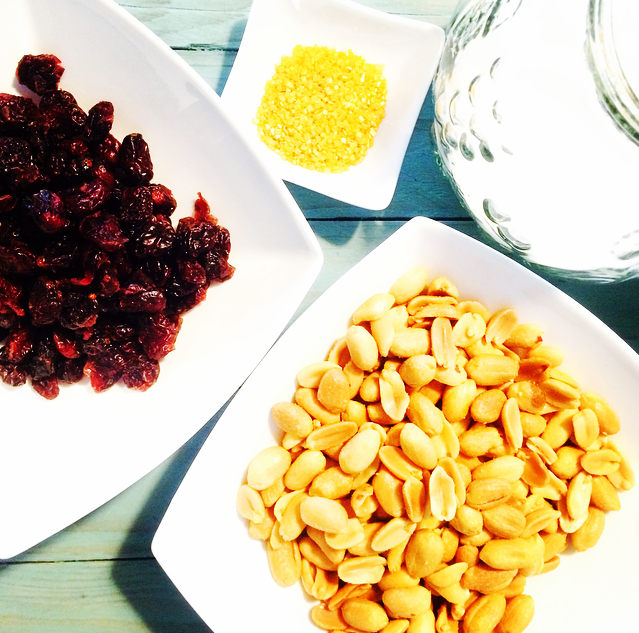 I also added some dried cranberries for the festive touch, and a few drops of gold sugar beads or edible glitter. Parchment paper, I once used brown greaseproof paper and the sugar stuck to it, so the white parchment paper is the best. I made two batches, the first I used much more fruit and nuts, and although the brittle was still good it was much thicker, so the below recipe might seem sparse in the ingredients but you get a better snap of brittle!! 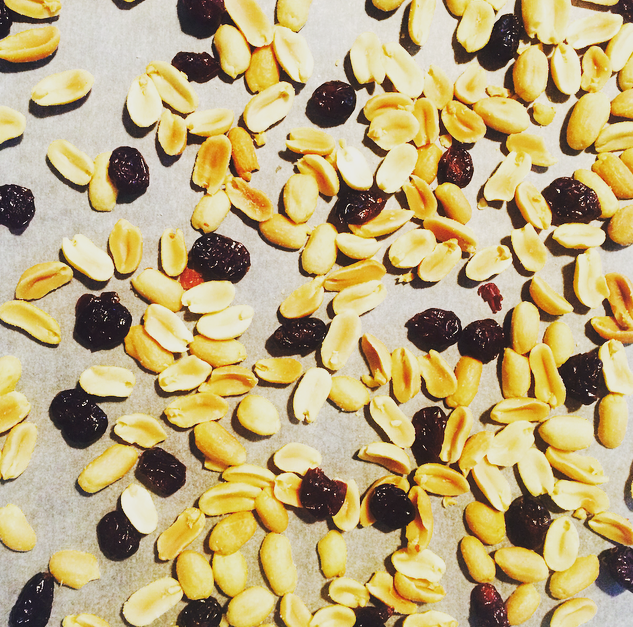 On a flat oven tray place a sheet of parchment paper, sprinkle on the nuts evenly, then drop in the cranberries. I also tried to break as many of the nuts in half as I could, so you can a nicer layer of brittle. Next empty the sugar into a good non stick sauce pan, turn the heat to high and let the sugar melt. This is the tricky bit as the sugar can easily burn, keep shaking the pan around and as soon as the sugar turns a golden caramel colour (even if all the sugar has not all melted) take of the heat then stir it until the rest has melted. You may need to pop it back on the heat for another minute….just be careful as if the colour of this goes too dark the taste will be very bitter. Once it is all dissolved pour over the nuts and fruit as evenly as you can. Now you may need to hold the tray up on its side so the molten sugar runs and covers all of the fruit and nuts. Next take your gold beads and sprinkle them over the brittle evenly. The syrup hardens very quickly so try to be fast with the pouring of this and the sprinkling of the beads. Once it is fully cooled break it up into pieces, and if it lasts that long wrap it up and give as a gift, it doesn’t really last long in this house!!! The pan can be a tricky thing to clean and the spoon will be stuck in it!! Just boil the kettle and pour into the pan it will clean it up easily. Never store the brittle in the fridge, wrap it in more parchment paper and pop into a airtight container, store in a cool dark place. If stored correctly it should easily last a week possibly but if making it as a gift I would make as near to the time as possible. Never store the brittle in the fridge, wrap it in more parchment paper and pop into a airtight container, store in a cool dark place. If stored correctly it should easily last a week or two but if making it as a gift I would make as near to the time as possible.